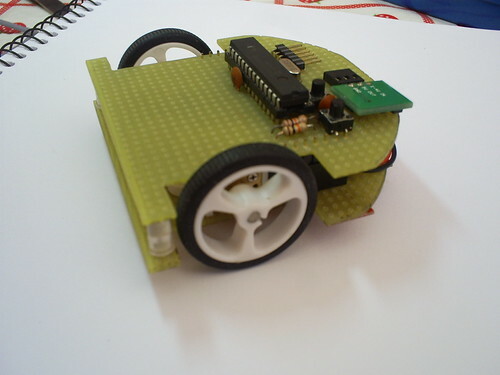 I few months ago, I started a prject of a little robot, to be able to self study some control, resolve maze algorithms and do something fun. 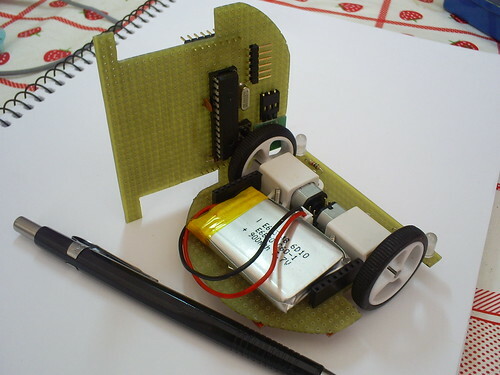 The robot needs to be small with very quickly and smart movements. 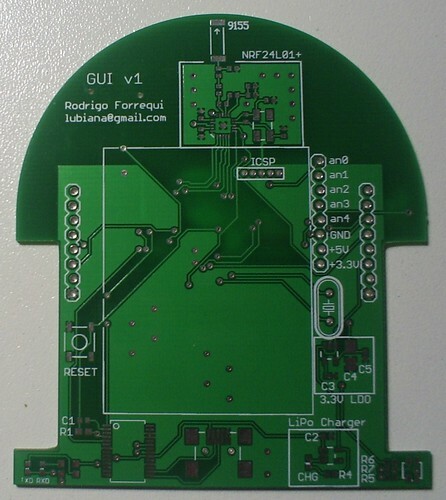 After some tests that comprove some abilitys, I started to design a well polished and projected PCB. Now the hard work begun. 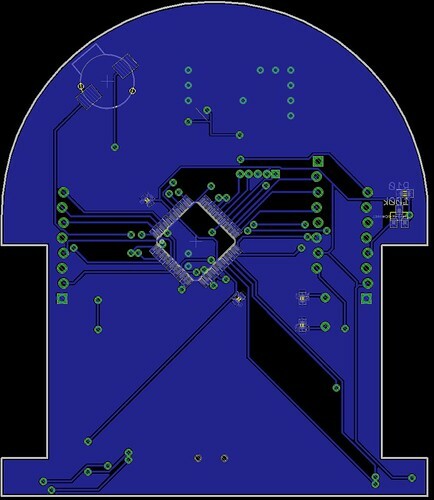 I used Eagle software to design the circuit and PCB, but I don’t have all parts I want. 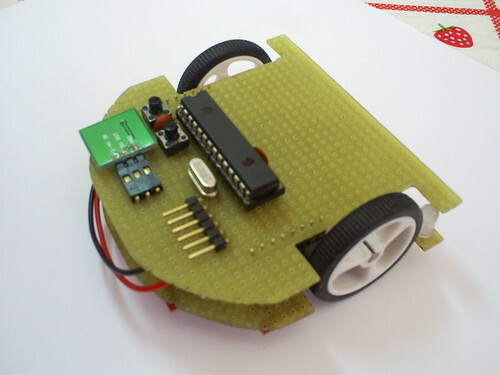 So, I’ll go at SparkFun to find some devices I like to use in the robot. They have all really nice stuff you can think. The processor (a Microchip PIC18F452) running at 20MHz and control motors speeds, LEDs, Buzzer, Wireless and all the embbeded stuff. It’s using a Bootloader to facilite the program upload, so the user don’t need complex flash programers to load their own software on the board. Just compile your program and upload via USB cable using a serial program like Hyperterminal or Putty. 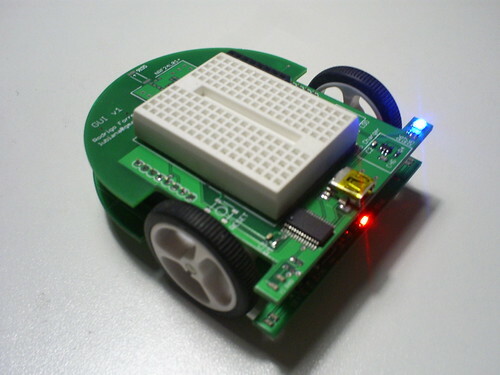 It’s power come from a little 3,7V Lithium-Polymer battery, charged via USB mini-B connector. I’m calculating the robot autonomy, as son as possible I’ll post this important data. The total cost of the robot it’s about $200 (excluding post services of board and components). The robot don’t stay in comercial prodution…maybe after some corrections and testes I change my mind. It’s finished! (almost). The Motor Board PCB arrives and I’ve soldered all components together. The final results looks awesome to me! Most beautiful that I’ve planed. 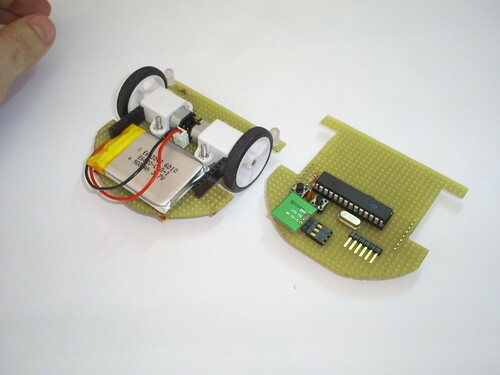 There’s some parts that I don’t solder, because I need purchase a SMD rework station (all solders on this robot are made with a ordinary solder station). I’ve used the RA4 pin of PIC18LF452 for digital I/O, but unfortunately according to datasheet, that pin is a open drain. 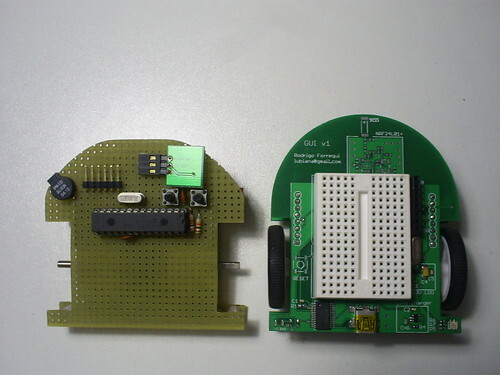 To operate like a common digital I/O it’s need a pullup resistor, but I don’t put it on my design. I need to solder the pullup 10kΩ SMD resistor. 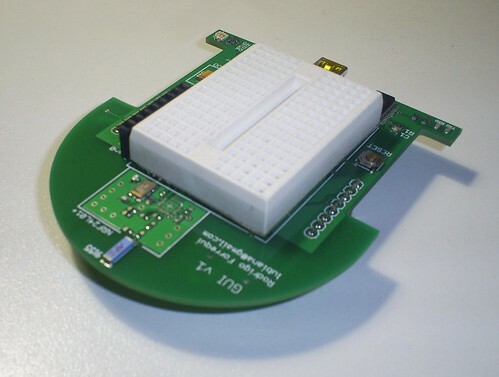 Lesson: All the times, read the entire datasheet before use any device pin. In my Eagle motor library, I don’t provide horizontal restrictions to the motors area. Then, a little decouple capacitor stay above the motor, touch the white bracket motor house. This make a bad contact between boards. This capacitor it’s for crystal stabilization, so I removed it. 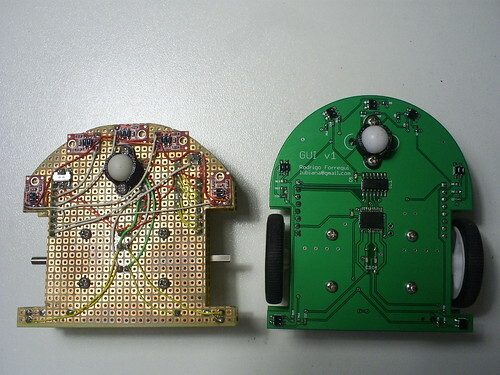 Now, the wireless part (NRF24L01+ transducer) waits to be soldered. It’ll on the party next month. So, the whole project has been closed and I’ll work on the software development, that I only write a very basic functions for test and maze solves. 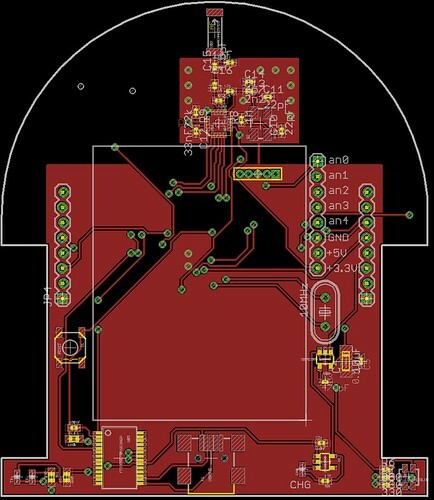 When I start the PCB design I’ll think that some modifications can be done, like that a more power MCU and other goodies, like wireless communication. 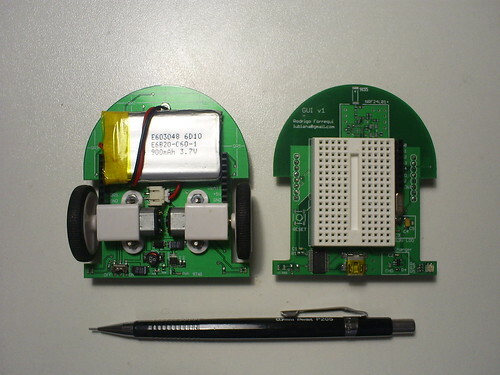 Today most of DIY electronics projects use ZigBee or XBee for wireless communication. But i like to use a very low power device. I think that use one of the devices from Nordic, like nRF2401 or nRF24L01+ is a good choice. They aren’t full-duplex, but it’s don’t become a problem to me because most of I want is for telemetries, where the robot send data and receive in distinct moments. Some of these mistakes besides on design with components that you don’t have in your hands or that you can’t find to purchase. This is a tip for everyone starting a new design: only use components that you really now where obtain. Some parts may appear to be easy to find, but they don’t. This a video with the board in test. 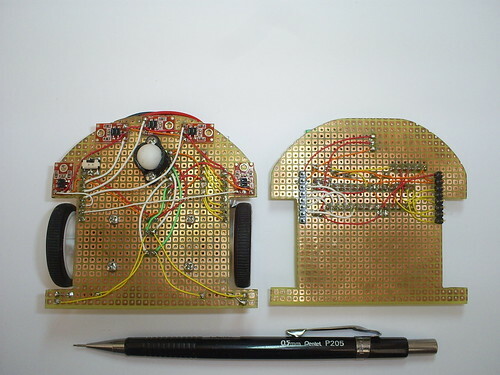 The motor board, with the motors, h-bridge and other parts are in late because a great mistake: one of the connectors between boards are reversed (Duh!). Was soon the motor board comes I’ll post the final mount and tests. Next post I’ll show circuit details. Bye. 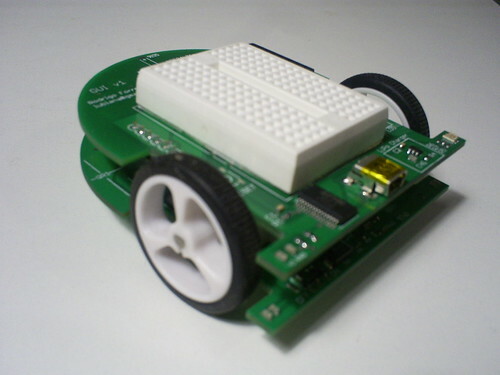 Than, after this little challenge, I started to design a professional PCB for my robot. I used the great Eagle for that. I’ll post more brief. About the H-Bridge and motors. My experiency with SN754410 is good. It’s a good device, friendy DIP package (don’t say the same about L298). 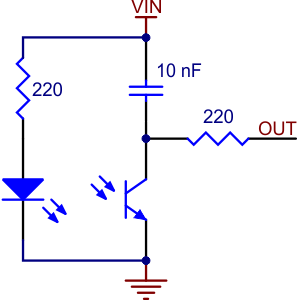 But (always there’s a “but…”) it’s have a great voltage drop across the internal transistors. If you put 6V at Vmotor and a 1A load, you get Vmotor – 2V, so only 4V to the motors. For my robot I want a more efficient H-Bridge. L298 and L293D are bigger devices, have the same problem than SN754410 and… I hate L298 package. So, I move to a new device. Pololu have it in a nice breakout board, very friendly (above). After some test, they are chosen for GUI v1. GUI v1 is little robot I was design over the last months. I have already made some other robots, but I don’t even finishing most of them. 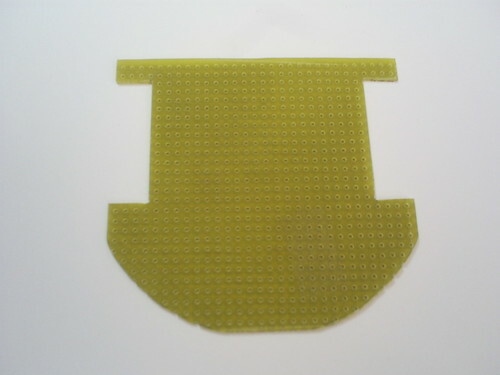 This design has various issues, and challenges. But it’s almost finished. Now I’ll post some steps of your design and construction. 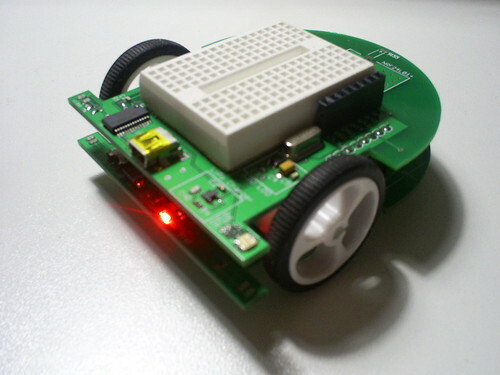 If you like it, visit my project page a LetsMakeRobots. It’s a awesome site with a lot of robots and good people. 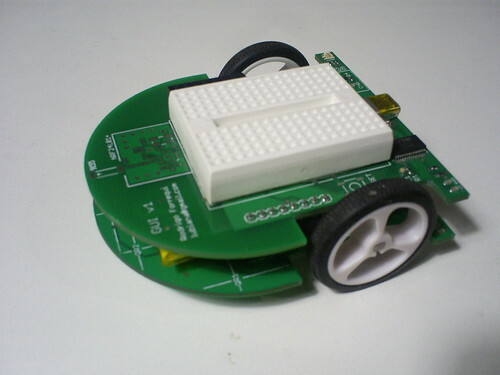 First, going to my desires: I want a little robot, with little wheels and little motors. They need to be battery powered, but a little battery. So, with this great inspiration I begin it’s prototype. 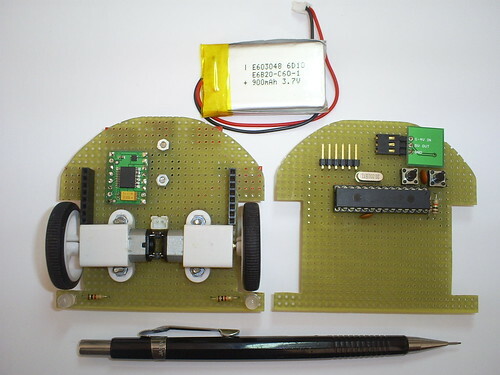 Maybe what I said now sounds a little amateur, but, when I have started, I don’t have a clear idea of how the final robot looks like, but I knew that your lines should be clear, without wires growing up. 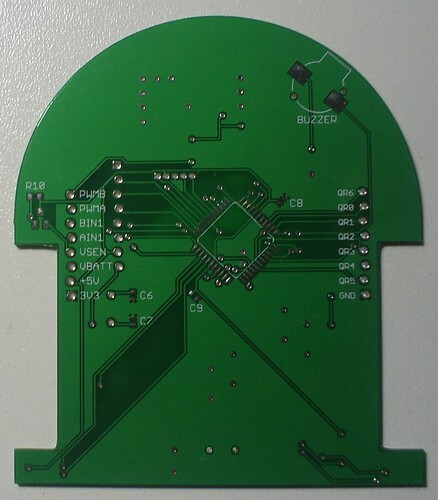 Now, the nightmare begin: solder every part to PCB and wire all. I like, but I hate this. 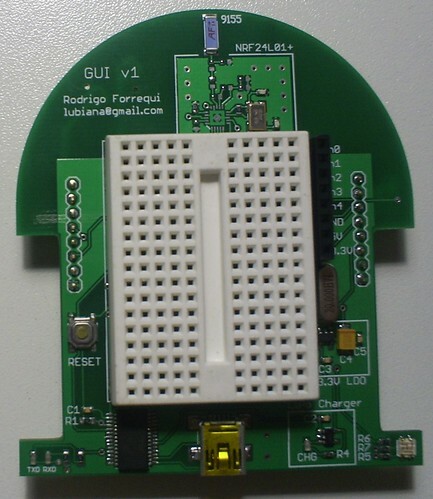 The PIC18F252 has the PIC Tinybootloader inside, for speed up the code development. Bootloaders have their issues, but my design is for a robot with easy upgrade capabilities. I like that everyone how like to change their software, can do this without bought a PIC programmer. 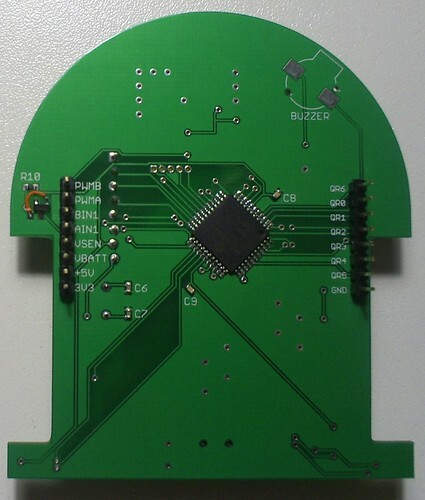 I don’t use all pins, but a think that for the final version, some other PIC is a better choice (like PIC18F452). The reflectance sensors are the QTR-1RC from Pololu. They have a QRE1113GR, that is a emitter-receiver pair. Pololu sells this sensor with two versions, one digital and other analog. 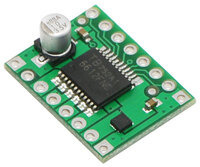 The analog version (QTR-1RA) needs a ADC line on MCU. Most of MCUs today have one, so don’t worry about your choice. Now I have to sleep. Tomorrow I’ll post the next steps. Bye.